The Groove is the ONLY place in New York City to hear live FUNK, SOUL, and R&B music 7 nights a week! Greenwich Village has had a long history as a music mecca. Artists from far and wide have performed at the tiny clubs which once dotted every single street, however now just a few vesitges of the Village's past remain. The Groove is one that remains, honoring the rich musical tradition of Greenwich Village. Groove is a cross between and neighborhood bar, with regulars who know your name, and a live music venue. We open daily at 4:30 pm with a great happy hour - $5 drink and food specials untill 7pm (happy hour on weekdays only). We have a couple of outdoors tables and big windows that allow for a nice quasi-outdoor atmosphere when the weather is nice. Most of our shows Monday - Thursday are $5 or free... yes, that's right... FREE! Reservations for groups of 6 or less are not needed during the weekdays, and you can swing by anytime for a drink and some killer live music. We have full seating in front of the stage, as well as a more casual standing/seating area at the bar. The weekends at Groove get TURNED UP! We sell tickets in advance for the main shows of the evenings on Fridays and Saturdays, and this is HIGHLY RECOMMENDED to ensure entrace. Dress code at the Groove is casual, however we don't allow sleveless shirts or open toed shoes for men (save it for the beach, fellas). More questions? Feel free to call us at 212-254-9393 and we'll be happy to help. See you at The Groove! 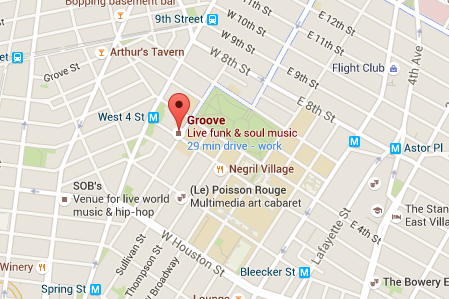 LOCATION - The Groove is located on the corner of W 3rd and Macdougal Street, one block east of the W 4th subway station. Parking is available on the street, or this is paid parking available in the garage on W. 3rd between Macdougal and Bleecker.